There are a number of problems that can affect your vision without treatment. By regularly visiting your eye doctor, you can discover problems earlier before they become serious or irreversible. An eye concern, like glaucoma, may have no symptoms until it is very late in development. Glaucoma affects your eyes as it causes damage to the optic nerve, worsening over time. Without treatment, this could cause blindness within just a few years. Without treatment, pressure in the eyes will likely increase, affecting the nerve responsible for transmitting images to the brain and resulting in a permanent loss of vision. Glaucoma often occurs when eye fluid isn’t able to circulate properly in the front part of the eye. This often occurs as pressure in the eye increases. If the fluid is blocked and builds up in the eyes, the increased pressure will damage the optic nerve. Open-Angle Glaucoma – The most common kind of glaucoma (also called wide-angle glaucoma) in which the eye structure appears normal but the fluid is not flowing or draining properly. Angle-Closure Glaucoma – A less common form of glaucoma (also called acute angle-closure, chronic angle-closure or narrow-angle glaucoma) which can cause a sudden buildup of eye pressure due to poor drainage because of the narrow angle between the iris and the cornea. Glaucoma typically is inherited and may not show up until later on in your life. Patients over 40 – especially those with a history of glaucoma in the family – should have a complete eye exam annually or bi-annually. Less common, glaucoma can also occur in young adults, kids or even babies. Diabetes also increases your risk for developing glaucoma as well as having African, Hispanic, Irish, Russian, Japanese, Inuit or Scandinavian descendants. The African race and their descendants tend to suffer from especially increased rates of glaucoma that occurs at earlier ages and results in more severe vision loss. Though unusual, glaucoma can also be caused by blunt trauma or chemical injury to the eyes. Severe eye infections, blockage of blood vessels in the eye, inflammation in the eye and even unrelated eye surgeries can also cause glaucoma. Typically, patients experience few or no symptoms before experiencing partial vision loss. Often the first noticeable symptom is loss of peripheral vision (side vision), which may not appear until late in the disease. 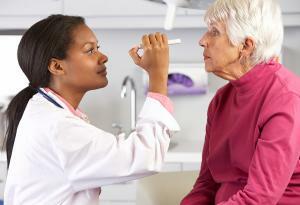 To help detect glaucoma early, regular eye exams are encouraged. When your eye doctor does a full optic exam, he or she will check for signs of glaucoma by testing your vision and dilating your eyes to get a clear view of the optic nerve. If glaucoma is found, you may be prescribed eye drops to reduce your fluid formation or increase the outflow depending on the cause of your glaucoma. A professional may encourage you to seek laser surgery or microsurgery to treat your glaucoma to improve the outflow of fluid from your eyes. As your optometrists in Maple Ridge, we offer regular visits to check your vision and optic health. Schedule your next eye care exam with us today and set your mind at ease!